A new study warns that conservation efforts need to be urgently stepped up if fish biodiversity in the Amazon — the highest anywhere in the world, with more than 2,000 species — is to be safeguarded in the face of the region’s many dams (both operational and planned), along with escalating drought brought by climate change. The study, led by Lawrence Hurd, a professor at Washington and Lee University, focused on how the population structure of different species influences their responses to changing conditions — including the breaks in connectivity brought by new dams and climate change. Fish conservation can be more effective, the researchers argue, if it takes individual species responses to such stressors into careful consideration. The researchers looked closely at metapopulations: dynamic, interconnected sub-groups, or subpopulations, within an individual species. These sub-groups have a patchy distribution — with each subpopulation separated from all other subpopulations for much of their time — living within Amazon floodplain lakes and various headwater tributaries, for example. Metapopulation isolation is not permanent, however: individuals can move from one population to another when Amazon floodwaters rise or via migration. This dispersal and intermingling of the sub-groups can help maintain genetic diversity and keep local populations plentiful, which is the key to the health of a species overall. The team reviewed the ecology and life history of different Amazon fish species, and concluded that while some species exist as metapopulations, others do not. But some are heading toward becoming metapopulations due to human impacts, with important implications regarding decisions concerning the best conservation strategies to protect them. It’s easy to make false assumptions about metapopulations, their movements, their ability to interbreed, and their capacity to adapt to reductions in connectivity. For some Amazon species, river and floodplain migrations mean that fish from different areas regularly come into contact, resulting in one large, inter-breeding population. But for others, such as one species of Amazon catfish (Brachyplatystoma rousseauxii) that isn’t the case. It undertakes the longest migration of any freshwater fish known, so one would imagine that individuals from one subgroup would interbreed with other subgroups along the way. Not so. “These fish breed in the Andean and pre-Andean headwaters, and larvae drift downriver through five countries (approximately 5,500 kilometers (3,417 miles) to the estuary of the Amazon,” the researchers state in their study. But the fidelity of individual catfish to their original breeding sites means that very little sub-group mixing occurs, despite the great distances that the fish travel alongside others from different headwaters. Returning ‘home’ for them “means that each tributary may produce a distinct genetic local population, the sum of which could constitute a migratory metapopulation of enormous geographic range,” the team writes. Dams are an obvious barrier to aquatic migration, and the burgeoning hydroelectric industry across the Amazon is disrupting animal movements along numerous rivers, as well as affecting flood dynamics. “The plain truth is that dam construction has to be halted or we are going to lose a substantial number of fish species,” Hurd said. While scientists are beginning to understand that the conservation of interconnected lake, river and floodplain ecosystems is vital to preserving Amazon fish populations, establishing those protected aquatic systems has, so far, been easier said than done. “There are very few protected areas [in the Amazon], and even those that have been established are seldom patrolled or enforced,” Hurd reported. His team suggests that one potentially fruitful approach to freshwater conservation is community-based management, with on-going monitoring to determine sustainable levels of fish exploitation. The researchers cite some successes in adopting this strategy, but also recognise that there are limitations and hurdles to be overcome, including facilitation by the Brazilian government. “Unless local riverine communities become convinced that regulation can ensure sustainable catches for them in the future, and work to enforce limits, establishment of preserve areas may be futile,” Hurd told Mongabay. One way to leverage better community participation, and to enhance local protection and enforcement, is to emphasize the commercial and nutritional value of Amazon fish species with local communities and the government, according to the study. Decision makers and river people also need to be educated about the other ecological services performed by fish. For example, some fish play a less known but important role in the Amazon ecosystem as seed dispersers — shaping and maintaining forest biodiversity. The larger the fish, the larger the seed it can disperse, meaning that overexploitation of fish stocks for human consumption — which always favors catching the largest fish — can have knock-on effects on the forest itself. Ironically, well-meant fisheries laws, which legally protect smaller fish over bigger ones, can be detrimental to seed dispersal and forests. The failure to protect aquatic systems at the federal level remains a serious problem. “One of the biggest hurdles [to conservation] is the Brazilian government which has not, to put it mildly, been a friend of biodiversity or of environmental conservation,” Hurd concluded. 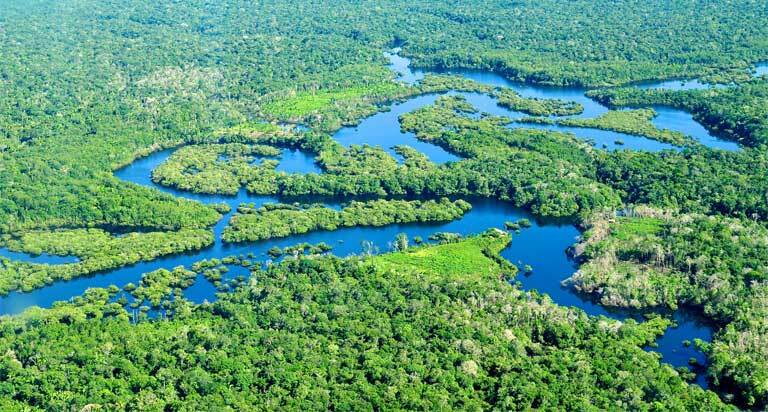 Leandro Castello, of Virginia Polytechnic Institute and State University, agrees that a broader perspective is necessary for conserving the connectivity of the Amazon’s freshwater ecosystem. “[C]onservation of biological resources in the Amazon will not be successful until we stop addressing conservation issues at small geographical scales and start considering how the Amazon forest-river system is hydrologically connected as a single entity,” Castello told Mongabay. “We unfortunately have a tendency to think of one protected area here, and another there, as solutions to these problems. The time has come to scale up this thinking to encompass the whole basin. We can continue to think and act as we have been doing, but we do [so] at the risk of the demise of the Amazon,” he warned. L.E. Hurd, Sousa, R.G.C., Siqueira-Souza, F.K., Cooper, G.J., Kahn, J.R., Freitas, C.E.C. (2016) Amazon floodplain fish communities: Habitat connectivity and conservation in a rapidly deteriorating environment. Biological Conservation 195: 118-127.